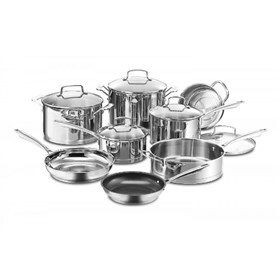 The Cuisinart 89-13 is a set of 13 professional stainless steel cookware. The exclusive powerbond™ high impact bonded base heats fast, distributes heat evenly, and is induction cooktop ready. The riveted stainless handles provide strength and durability for ultimate control. The tempered glass flavorlock® lids seal in moisture and nutrients, cookware is oven and broiler-safe up to 500°F for superior versatility. Glass lids oven safe up to 350°F. The Cuisinart 13 Pc. Professional Series Stainless Set has many exciting features for users of all types. You can extend the lifetime of your Cuisinart 13 Pc. Professional Series Stainless Set with the purchase of a FactoryOutletStore Factory Protection Plan. The Cuisinart 13 Pc. 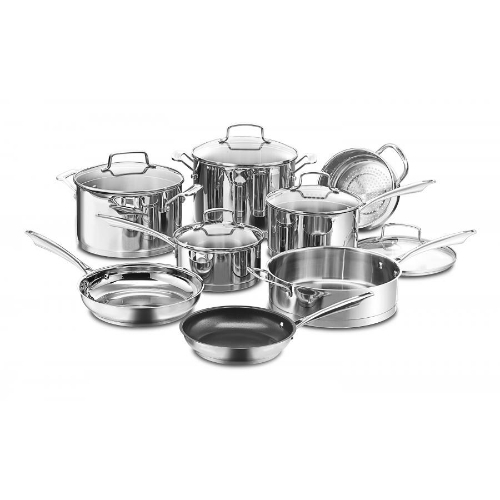 Professional Series Stainless Set is sold as a Brand New Unopened Item.